Muscles strains are common among athletes from all backgrounds and training levels, and the most common type that plagues runners is hamstrings strains, the group of muscles running down the back of the thigh. 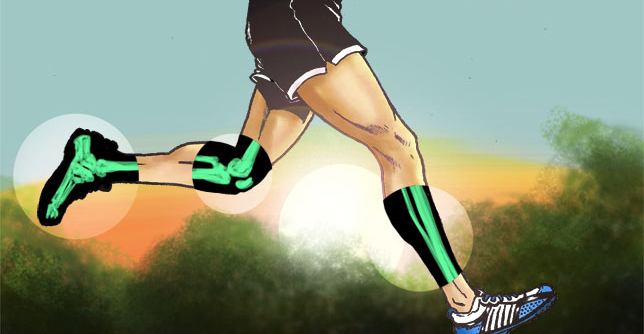 Hamstring strains is a condition is which there a slight tear or overextension of one or more of the three muscles in the back of the thigh (the semitendinosus, the semimembranosus, and the biceps femoris), all of which are in charge of bending the knee. Beginner runners are more prone to muscle strains because their muscles are not used to the high-impact nature of the sport. If you do any sprinting or a lot of speedwork, then you are more likely get the condition. Other causes of the condition include skipping a warm-up, doing too much too soon. Hamstrings strains manifest as tender stiffness and pain along the back of the thigh, especially when trying to stretch the muscle, speeding up or slowing down while running, or sometimes, anytime you perform any knee bending activity. Most hamstring strains can be treated at home and without much hassle. If you have just strained your hamstrings, then stop running immediately and apply the RICE method on the spot. Take a couple of days off (or more) from running, ice the painful area for 15 to 20 minutes a couple of times a day, and keep the injured leg elevated on a pillow to speed up recovery and reduce swelling. Recovery time varies from one runner to the next, taking anything from two weeks to three months, depending on how serious the muscle strain is. First of all, make sure to start all of your runs with a proper warm-up. If you are planning to do a sprint or speedwork session, then invest at least 15 to 20 minutes in a dynamic warm-up, comprising of light jogging, dynamic exercises, such as inchworms, squats, and lunges, and running drills to get your body and muscles ready to fire at maximum speed. A wide range of motion in the lower body is also vital. As a result, increase your flexibility and mobility in the posterior muscles and tendons so your hamstrings are no longer prone to being strained or overstretched. You can also reduce the strain placed on the hamstrings by strengthening your glutes and hip abductors, reducing hamstring irritation. This entry was posted in Articles, Injury, Performance, Prevention, Running, Sports, Therapy, Training, Treatment by sportsmedicineweekly. Bookmark the permalink.